One of Detroit's most beautiful flagpoles is found at the intersection of The Stand and Vista Way. Where's that, you ask? 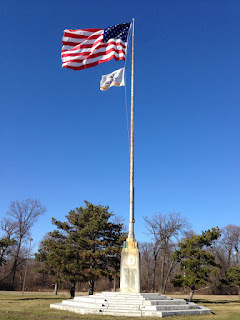 Well, go across the Douglas MacArthur Bridge and circle around to the south side of Belle Isle, and you will find this awesome flagpole. The flagpole is a tribute to the Reverend Samuel Francis Smith. As you'll see in the video it is a memorial from the school kids in metro Detroit sponsored by the city's Rotary Club. The magnificent structure was designed by none other than the famous Detroit architect Albert Kahn. According to the BelleIsleConservancy.org, the flagpole was designed by Kahn and sculpted by Samuel A. Cashwan. Perhaps the most well known aspect of the Rev. Samuel Francis Smith's life is that he wrote the song America (My Country 'Tis of Thee). Before the Star Spangled Banner became the official national anthem for the United States, Smith's patriotic America, was commonly sung and served as a national song. Well, with that bit of information, it won't be hard to guess what the soundtrack to the video is. Side note: the soundtrack only has the first verse of the song, enjoy!